Students who earn their Phlebotomy Certification will be prepared to collect blood for donations or testing by way of venipuncture or skin puncture. Phlebotomy classes at MedQuest will prepare each Phlebotomy Technician to fulfill the requirements of several healthcare facilities. Most Phlebotomy Technicians work full time finding employment during day and evening hours. Travel could be an option for several healthcare providers. Our Career Services Director provides assistance to graduating students and alumni that include instruction in resume writing, preparation of cover letters, interviewing techniques and networking skills. The college provides job placement assistance for its graduates. Alumni in good standing may continue to use any and all placement resources indefinitely at no charge. 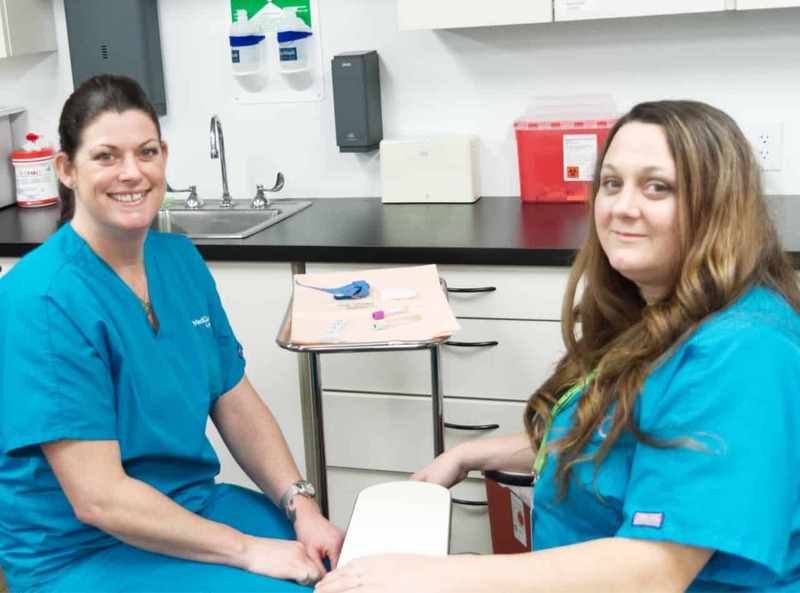 The Phlebotomy course is designed to prepare students with the training and knowledge required to comprehend and apply technical and clinical skills necessary to perform phlebotomy procedures in both clinical settings as well as laboratory settings. Course objectives include the history of phlebotomy, defining the phlebotomist’s role in health care, OSHA and CLIA standards, medical asepsis techniques, basic human anatomy and medical terminology specific to the lab setting. The course also includes infection control, all aspects of blood collection, equipment, and possible complications. The student will have hands-on experiences and practice how to collect, prepare, test and report specimens through venipuncture and capillary techniques. For a complete list of Disclosures, please click here. MedQuest College has provided high-quality instruction to students in Kentucky and Indiana since 1999. By providing Southern Indiana, Louisville and Lexington Kentucky, and surrounding areas with quality programs in medical assisting, dental assisting, diagnostic medical songoraphy and biomed equipment technician we are able to proudly say that MedQuest College has successfully employed hundreds of graduates in the medical fields. Our campuses are located in Louisville Ky and Lexington KY. We are institutionally accredited by the Accrediting Bureau of Health Education Schools (ABHES), a nationally recognized accrediting body. I leave every day having learned something new. Every day we do something hands-on and the teachers are wonderful. Our small class sizes help to grasp the concepts better. The available technology and resources really help you to understand the dental office better. I have absolutely no complaints about this school. MedQuest has everything you need to learn. I love the school. I would recommend to everyone that likes small classes and really good teachers. I have learned a lot, and by the end of my classes, I will be prepared for a good job at a dental office. It is all because I was well-prepared by the instructors. It has everything you need to learn. Are you ready to learn more about MedQuest College? Click below to request more information about the program of your choice.